(Washington, DC) September 16th, 2008 -- A new suite of mobile advertising services helps advertisers add one-step online interactivity to their print and on-air advertising campaigns, and helps mobile advertisers extend the reach of their current SMS text advertising programs to smartphones and Web-enabled mobile devices, such as Apple’s iPhone. Internet Media’s Jump Code System helps advertisers and mobile advertisers provide consumers with one-step access from print, on-air, or out-of-home advertising to targeted interactive promotions located at “deep URLs” on Web pages or microsites on the advertiser’s Web site. Consumers enter Jump Codes displayed in print advertising, direct mail, billboards, or broadcast television and radio into their smartphones or any Web-enabled mobile device to link instantly to advertiser promotions or additional product detail and descriptions, without having to enter the long and cumbersome URLs required to reach these highly targeted Web locations. The Jump Code System now allows advertisers to link consumers who see their “offline” advertising in print, broadcast, direct mail, or outdoor instantly to the customized online promotions and detailed product information on the advertiser’s product. With Jump Codes, it is now possible to make these “offline” ads fully interactive, by linking consumers instantly to the targeted promotion or product information page at the online Web location deep within the advertiser’s Web site. 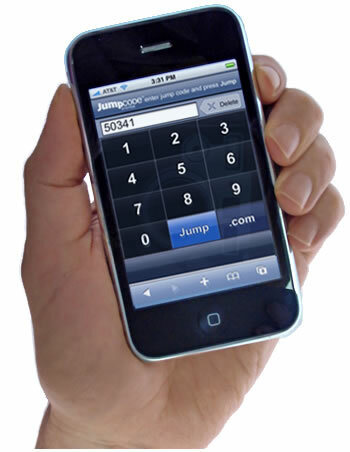 The Jump Code System allows advertisers to provide mobile consumers with an instant Internet link from the “offline” ad to the specially-created online promotional offer, the detailed product information page, the free sample, or another “call to action” incentive that engages consumers at the moment they become interested in the advertiser’s product, allowing advertisers to accurately measure response from these integrated campaigns. Advertisers can add interactive Jump Code access to their advertising by obtaining Jump Codes from Internet Media’s new Jump Code registry at www.JumpCodeSystem.com, where advertisers can lease Jump Codes for defined time periods and promotions, linking them to the URLs for the specialized Web locations or microsites they wish to make accessible to consumers from their advertising. Consumers enter Jump Codes seen in advertising on Internet Media’s gateway, www.JumpCode.com, to reach the advertiser’s targeted Web location, without having to enter the long URL associated with that link. With Internet Media’s new Jump Code mobile advertising features, mobile advertisers now running SMS text messaging advertising programs using Common Short Codes (CSCs), can now add Jump Codes matching their current Short Codes to extend the market reach of their current text messaging-based mobile advertising programs to Internet-based promotions targeted to consumers using next-generation smartphones, such as Apple’s iPhone, Web-enabled mobile phones, PDAs, laptops, and PCs. According to industry experts, Web accesses by mobile phone users have increased 29.4% in Q2 2008 from the previous quarter, according to a wireless usage index compiled by Crisp Wireless, a mobile solutions and services provider. Using Internet Media’s new mobile Jump Code applications, mobile advertisers, integrators, ad agencies, and consultants can now implement their own mobile advertising programs for the growing market of mobile consumers using smartphones and other Web-enabled mobile devices without having to overcome the obstacles of dealing with aggregators, or getting on the “data decks” of wireless providers.